While you can make miniature teacups and saucers freehand in polymer clay, it is easier to make matching sets using simple press molds. 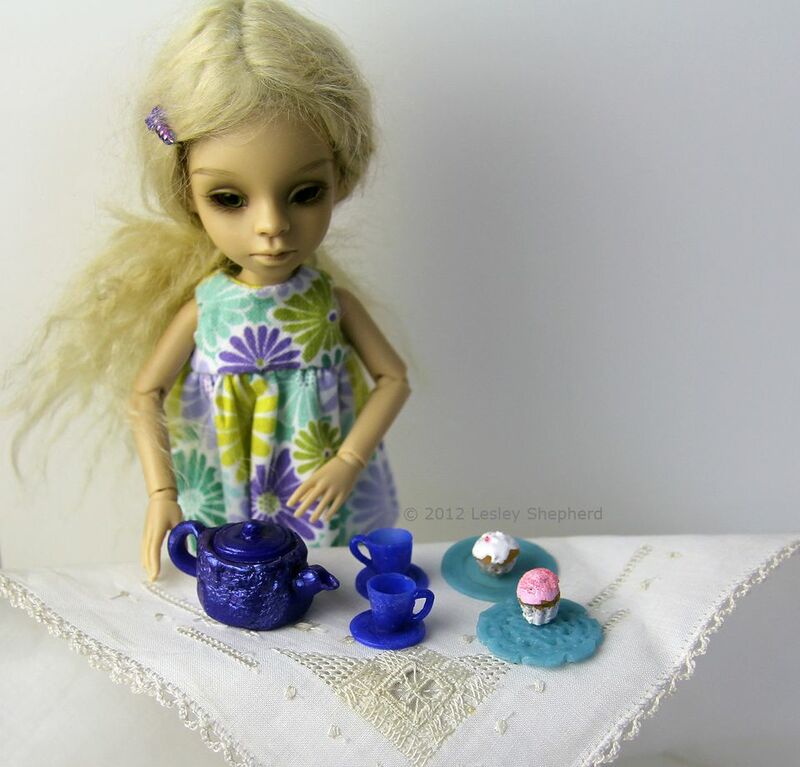 The saucers are made the same way as the Miniature Polymer Clay Dessert Plates and are designed to match the opening dollhouse teapot. If you don't want to use silicone mold putty, you may be able to shape your teacups using the inside of a glue bottle cap, or half beads, pressing the clay to the shape using the same technique used with the mold in these instructions. Polymer Clay - Use a fairly strong and elastic clay so you can roll it thin enough for realistic teacups. Adding transparent clay to colors will usually make it stronger. If you are new to using polymer clay, learn how to use polymer clay for miniatures before beginning this project. Release Agent - for your particular clay brand, usually talcum powder or cornstarch. Basic Shape - Teacups are usually two to four inches tall, so choose an appropriate sized bead for your particular scale. Acrylic Glaze - you can use a clear acrylic floor polish instead. Fine Sandpaper - wet dry sandpaper above a 200 grit works well to polish the edges of your teacups and saucer. Embossing Tool or toothpick - to apply the handle to the teacup. Fine Wet/Dry Sandpaper - 200 grit or finer. Clay roller - to roll out thin sections of clay for the saucers. Clay blade - to cut the clay sections. Circular Cutter - This is sized to fit the outside edge of your saucer. You can make a custom cutter the same way you make miniature cookie cutters if you can't find a suitable thin-walled tube or plastic straw. Thin card - to make the master shape for the saucer rim. Use circular paper cutters to make a small ring from two layers of card which was the correct size for a rimmed saucer for my teacup. You can either roll polymer clay into a thin layer and press it over this basic template, cutting it with a circular cutter (a large drinking straw or a small plastic tube work well) or you can make a two-part silicone mold. To make the basic press mold for my teacup, use the end of a ballpoint pen as my shape and filled in the narrow opening with modeling clay. Set the pen tip, wide end down, on a table, and fit a circular template over it, using the circle that rested on the pen tip at the point where you want the top of my teacup. The mold will be formed upside down over the pen tip as shown above. To make sure the circular template remained flat and didn't tilt. To make the mold, mix two-part silicone mold putty into a small ball and carefully place it over the narrow end of the pen tip, pressing it down onto the flat surface of the circle template. Leave enough putty to give good coverage of the narrow end of the pen tip, then flattened the putty above that narrow end with a ruler. The mold is being made upside down, so the putty will become a flat base for my mold. To make the cups for your miniature teacups, take the same shape you used for the shape of your teacup press mold and coat it with a release agent (talcum powder). Press the shape into a small ball of soft conditioned clay in the bottom of your mold. Press the shape gently into the clay, working it into the mold until the sides of your teacup are the correct thickness. Trim the excess clay from the top of your mold. If your mold shape is metal, like my pen end, (or a metal bead) you can bake it in the mold with your clay and remove it when the clay is cured. If your shape will not withstand heat, remove it from the clay before you place the mold with the pressed clay into the oven to cure. You may want to basic cup shapes and saucers before adding handles to the teacups. This allows you to work with thinner clay layers. You may have to test your clay, as some colors will change in the baking process. If this is the case, you may have to bake your cup after you add your handle, otherwise, the body of the cup and the handle might be different colors. Before adding the handle to my miniature teacup, make sure the cup fit the saucer, and sand the edges of the saucer, the base, and top edge of the teacup. Wet-dry sandpaper or dampened micromesh sanding pads work well to sand away any imperfections on the edges of your teacup or saucer. Dry sandpaper creates dust, and polymer clay dust should not be inhaled. To make a flat base on your teacup, rub the bottom of the teacup over the sandpaper in a "figure 8" pattern. Take care not to tip the cup as you sand the base. Check the teacup stands square in the saucer. When your teacup has a finished top edge, you can roll out a thin roll of clay and fit it to the cup as a handle. Fitting the handle to the cup after first baking the cup means you can make thinner miniatures from polymer clay. Use an embossing tool or toothpick to blend the end of the raw clay handle into the baked cup section. Press the end of the handle against the top side of the cup, then roll the handle down and blend the base of the handle into the side of the cup near the base. When you have the handle fitted and blended into the cup, bake the cup with the handle at the correct temperature for your clay. Leave the cups to cool after baking before handling them as the handles are very tiny. To add a bit more strength to the dollhouse teacups, as well as give them a more realistic glazed finish, Add a top coat of acrylic gloss finish to the teacups and sauces after they are baked. You can also use a clear acrylic floor finish or a coat of thin nail varnish if you prefer. To make the cups easier to glaze, stick them to the top of a brush handle or a skewer or toothpick using soft ​museum wax or modeling clay. Holding them on a stem like this keeps the base free of glaze, while you apply a gloss finish to the inside and outside of your miniature teacup. Coat the saucers the same way and allow the pieces to dry. If you want to make a teaset from polymer clay, make most of the set at the same time so your clay color matches and you work with a similar thickness of clay for the saucers, plates, and cups. Make a practice piece of each part of the set before you begin the full set. Roll sufficient clay out on a tile to cut the correct number of dessert plates and saucers from the same rolled out section of clay, or use single playing cards to set the thickness of clay as you roll it so all your plates and saucers will be an even thickness. Check the test piece handles after they are baked to make sure they can be placed in the hand of a doll if that is your wish. If not, try to roll thinner handles or form them with a larger loop so they will fit the doll's hand. Once you have a test sample of all your pieces, make sets of the plates, cups, and saucers you will need. If the clay discolors slightly between bakings, you may need to give the parts of the teaset a colored overglaze so the set pieces appear more closely matched. You can easily make a thin colored overglaze by adding a small amount of Jacquard pearl ex pigment to the acrylic glaze coat before you apply it to the teaset pieces. The teapot in the photo above has a colored glaze, while the cups have a plain clear glaze. You can see how the colored glaze will cover slight imperfections or mismatched pieces. Colored nail varnish may create a similar type of glaze, provided you can apply it in a thin enough coat.